The Republic is a bar and lounge that always intrigued me when I walked by, but for some reason, I never stepped inside until recently. I think it might be because the space looks really, really dark from the outside, which doesn’t come across as welcoming. But my glimpses of fancy, black armchairs lined up against the walls finally convinced me to try the place out. I was pleasantly surprised by the quality of the drinks and the friendliness of the employees. Inside, the club’s walls are either brick or black with lushly patterned wallpaper that could do with more light to show it off. The bar is lined with red lights. 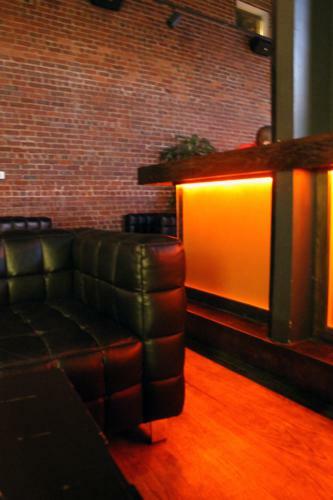 In addition to the row of seating areas on the main floor, there are more toward the back of the club and a much brighter alcove upstairs, behind where a DJ normally plays on the weekends. There are also tables on the street if you’d prefer your drink with easy conversation and no music. 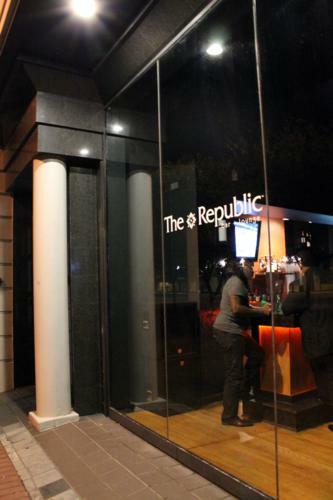 The Republic has a full bar and a cocktail list. I looked askance at the several cocktails made with Red Bull, but if energy drinks are your style, you might enjoy them! I definitely liked the other options on the list. I started out with a Berry Diddy martini. The drink was an incredibly pretty yellow. 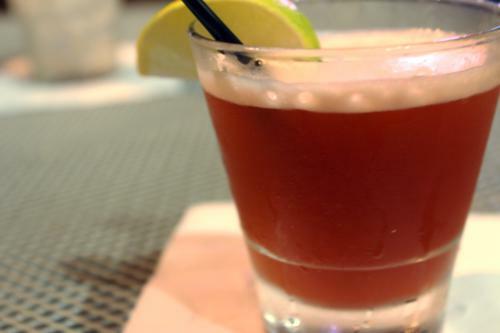 It’s made with Ciroc Red Berry vodka, lemon Juice, and simple syrup. It tasted very similar to a lemon drop, but the berry flavor from the vodka cut through the lemon, making for a refreshing combination. It was definitely sweet, so I’d recommend it for a dessert drink. 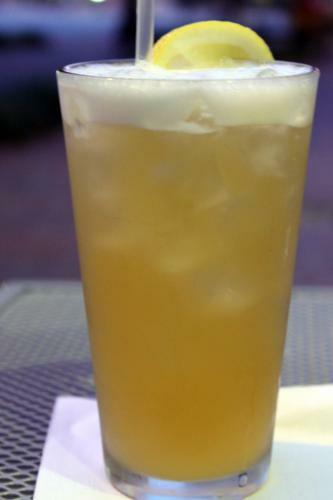 One of my friends tried the Republic’s Tea made with Firefly sweet tea vodka, Absolut Peach, a splash of sweet and sour, a splash of pineapple, and lemon lime soda. This one was like a drinking a peach sweet tea, and it was great. My second libation however, definitely took the cake, or cocktail shaker as the case may be. The Ooooh La La Martini—made with Crown Royal Black, raspberry liqueur, and pineapple juice—was pretty close to perfect for me because I like my drinks strong with something smooth to help them down. The raspberry seemed too prominent at first sip, but the whiskey mellowed it out nicely. It felt thick in my mouth, like it gained creaminess from the pineapple and the froth from the shaking. I loved it. All in all, I was very impressed with the cocktails I tried, but the Republic needs to do something to make the ambience more inviting, and I say that as someone who loves black and red. I just can’t put my finger on what it’s missing–maybe a better lighting scheme? 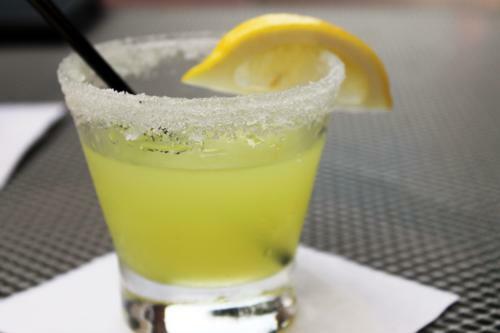 Regardless, the bartenders’ friendliness and quality of drink should be enough to keep you there for a round or two. Reviewed 2 Aug 11 and 26 Aug 11.